The Lemoore Future Farmers of America has been around a long time, almost as long as the National FFA – ever since its inception in 1928, when Calvin Coolidge was president and just months before the onslaught of The Great Depression; it’s been around even longer than Kings County Supervisor Joe Neves. To be fair Neves hasn’t been around that long, but he would be the first to give credit where credit is due. Neves served as the Lemoore High School’s FFA president in 1975-76, and his service was a harbinger of what was to be many years later, when he ran for, and won a spot on, the Kings County Board of Supervisors in 1995. He’s been there ever since. “We did a lot of projects” he said during what he referred to as the “lean” years for the Lemoore FFA. He remembered that to raise funds the organization sold Christmas trees and firewood and took on other community service projects. Lemoore's Kyle Jue with his Kings County Fair entry. It’s only fitting that the Lemoore FFA, one of the most successful programs in the country, which boasts an enrollment this year of 545 members, was recently named as the Lemoore Chamber of Commerce’s Organization of the Year, and according to many, the honor was way overdue. The local student organization, which celebrated its 85th anniversary just last year, will be honored at the Lemoore Chamber’s Annual Dinner and Citizen of the Year ceremony. The dinner is slated for January 22 at the Tachi Palace Hotel and Casino. For tickets contact the Lemoore Chamber at 559-924-6401. Evangelho wore the blue and gold FFA jacket proudly in his four years in the organization, culminating with the chapter presidency in 1990. And he remembers fondly his years in the FFA, particularly in 1988 when he and teammates Jason Rodrigues and Joey Rocha were named the state’s top dairy judging team. 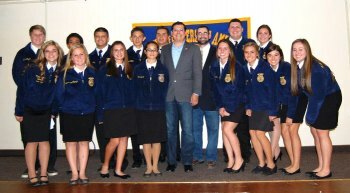 Assemblymember Rudy Salas with Lemoore High School FFA members recently. His two daughters, Meagan and Jessica, were both proud members of the Lemoore FFA as well, and he says his eighth grade son, Jared, will also serve. Evangelho put his FFA experience to the test when he joined with his father in owning and managing Evangelho’s Seed and Farm Store, located on Highway 41 at 9085 19th and ½ Avenue. The Evangelho’s just celebrated their 34th year in business. The Lemoore Future Farmers recognized a good thing when they witnessed the birth of the national organization in 1928. The Lemoore chapter was born on November 15, 1929, barely a few days after the October stock market crash. Over the course of the 85 years the Lemoore FFA has existed, thousands of students have indeed entered the hallowed fields of farming, but not all. Former members have also gone on to become doctors, lawyers, businessmen and leaders of communities, and perhaps even a few lowly newspaper editors. A photo from FFA's past. Showing off the new jackets. Such is the role that the Future Farmers play. While the focus may be agriculture, students are taught to be leaders, to work together, to learn how to speak, write well and present themselves in a professional manner. Any former member will recall that what he or she learned in high school FFA often translated into success in life. At least one present member of FFA agrees with his elder counterparts. LHS senior Griffith Jones is this year’s FFA president, and he credits the organization with providing him with the tools he will need to succeed in life, and judging by his prowess as a student leader, he has a bright future in store for him. “FFA has had a significant impact on every aspect of my life, as well as the foreseeable future,” said Jones. “Everything from the leadership skills to the hands-on learning experience has made an immensely positive impact on me as a person. 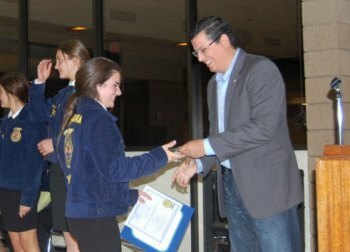 Moreno said leadership plays a big role in the typical student’s FFA education as all students are encouraged to participate in speeches, presentations, mock interviews, ceremonial presentations and more. “FFA teaches valuable hands-on education that students enjoy because they are able to see it, touch it, smell it, and receive a better understanding of how things work when they read it from a book and then apply their new knowledge with their own two hands. 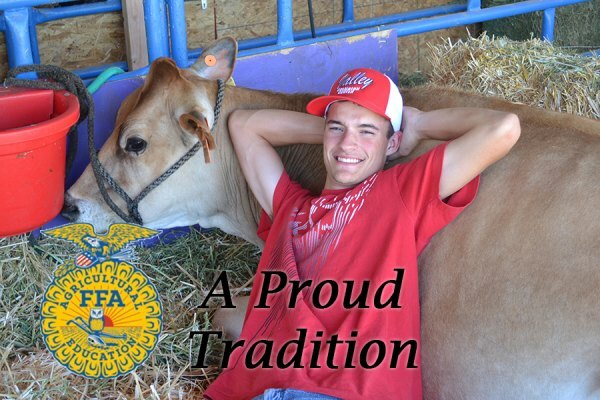 According to the National FFA, its roots originate from a time when boys were losing interest and leaving the farm. A Virginia man, Walter S. Newman, who in September 1925 became the Virginia State Supervisor of Agricultural Education, sought a solution to the problem and brought together some notable figures in agricultural education, among them Edmund C. MaGill, Harry W. Sanders and Henry C. Groseclose, staff members of the Virginia Polytechnic Institute Agricultural Education Department. Newman proposed forming an organization that offered farm boys "a greater opportunity for self-expression and for the development of leadership. In this way they will develop confidence in their own ability and pride in the fact that they are farm boys." Sound familiar? Thousands of Lemoore area students left Lemoore High School instilled with that very same confidence. Two years later, the idea reached the national stage during the American Royal Livestock Show in Kansas City, Missouri. That's when 33 young students from those 18 states gathered at the Hotel Baltimore to establish the Future Farmers of America. The group elected Leslie Applegate of Freehold, N.J., as its first president and adopted the national emblem – a mark similar to that of the original Virginia emblem – during the new organization's first convention. In 1929, national blue and corn gold became the official colors of FFA. A year later, delegates adopted the official FFA Creed and by 1933 the familiar official dress of blue corduroy jackets was adopted after convention delegates were enthralled by the jackets worn to Kansas City by members of the Fredericktown, Ohio, FFA chapter. The Lemoore FFA has continually had over 40 State Farmer Degree’s over the last 15 years, one of the highest averages in the whole state. In 2004 they had 58. This last year, Lemoore had 17 American Farmer Degree’s. Each year, the FFA continues to boast of regional and State Proficiency winners. Last year LHS had a national winner Cayci Allison in the Vet Science area. At the national level the Lemoore FFA won the National Model of Innovation award for Student Development, the first time the State of California has ever had an FFA Chapter win. 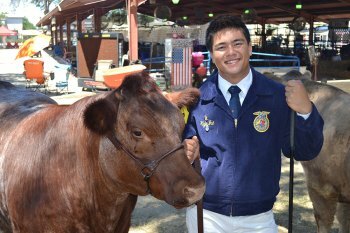 The Lemoore FFA consistently averages 60-plus members who show and sell their animals at the annual Kings County Fair. This year, as in past years, the LHS FFA enrolls about a quarter of the school’s enrollment in its program. Last year the FFA boasted of 540 members. Judging teams included completion in computers, business, ag sales, cotton, citrus, ag marketing, ag mechanics, horse judging, dairy cattle and more. In addition, the school’s ag department has an extensive curriculum that combines real-world subjects with a focus on agriculture. The school teaches a Veterinarian Science, Ag Biology, Ag Mechanics, Metal Arts, Floral Arts, Ag Government and economics, introductory and advanced agricultural science classes, and Agricultural Leadership. The school also has a 5-acre farm where students can house animal projects, work in a farm setting, utilize the tools of farming, plant crops, and much more. The local program also gets a lot of help, of course from local farmers, but also from an active parent booster group, which is an important member of the Lemoore High School Foundation for Educational Excellence, a foundation started by the school in 1999 to support students and programs at LHS. Many booster groups belong to the Foundation. Each year the FFA Boosters give away roughly $10,000 in the form of scholarships. In addition, the Boosters have become an integral part of keeping the local FFA program a success. According to the FFA’s national website, sadly, girls were restricted from the earliest forms of FFA membership by delegate vote at the 1930 national convention. That decision to deny female members for many years denied recognition of the key role women have played on farms and in agriculture since the days of the American pioneers. It wasn't until 1969 that females gained full FFA membership privileges by vote of the national convention delegates, despite many state associations permitting female members long before. New York's Anita Decker and New Jersey's Patricia Krowicki became the first two female delegates to the national convention in 1970. Today, females represent more than 45 percent of FFA members and roughly half of all state leadership positions. In 1976, Washington's Julie Smiley became the first female national FFA officer. California's Jan Eberly became the first female National FFA President in 1982. In 2002, Wisconsin's Karlene Lindow became the first female FFA member to earn the prestigious American Star Farmer Award. 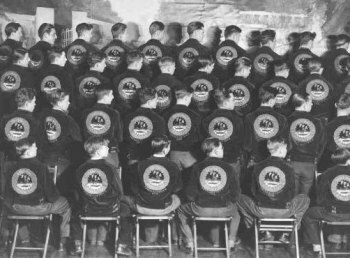 Since 1928, millions of agriculture students have donned the official FFA jacket and championed the FFA Creed. All 50 states and two U.S. territories are currently chartered members of the national organization, representing 610,240 individual FFA members and 7,665 local chapters. It's a testament to the power of common goals and the strong ideals of the FFA founders. Their mission was to prepare future generations for the challenges of feeding a growing population. They taught us that agriculture is more than planting and harvesting – it's a science, it's a business and it's an art.